Maybe part — but certainly not all — of the reason President Obama basically got away with claiming that Jacksonville, Flordia, Charleston, South Carolina, and Savannah, Georgia are ports "along the Gulf" is that the press is so geographically ignorant that it did not recognize the obvious mistake until someone outside of their bubble pointed it out. It's amazing how those lake-effect snowstorms manage to cross almost the entire Empire State to dump all that snow on Buffalo, isn't it? 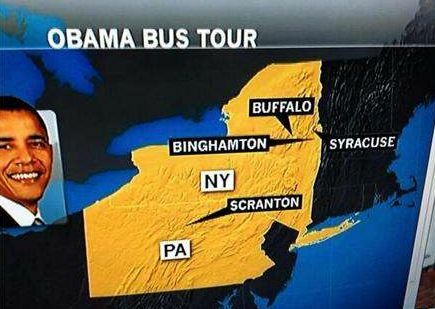 On MSNBC’s “Martin Bashir,” it appears that someone decided to “remix” upstate New York. ... Regular readers may recall that just a few weeks ago “NBC Nightly News” erased New Hampshire from the United States. Clearly, there are some geographical kinks still being worked out. I take that form of apology — "honest mistake" — to mean that MSNBC's really did believe that the cities involved were correctly positioned, even after conscientious review (An "oversight" would have meant that they just screwed up and didn't subject the graphic to appropriate review). The Media Bistro link to the New Hampshire snafu also notes that at around the same time, "on CNN, a story about Egypt featured a graphic… with the flag of Syria." Our news organizations are in the best of hands, aren't they? This seemingly trivial incident is a window to a more fundamental point, which is that demonstrations of sloppiness and ignorance such as these should make us very confident that many other pertinent facts of greater interpretive import are either misreported or not reported by our establishment press on a daily basis.